Just a week ago, a big group of friends and I were stuffing ourselves with Sichuan food and Japanese/Taiwanese odds and ends at Metro Cafe in Sunset Park. Right above are the beef tendons, slick with oil and Sichuan peppercorns, and below are two choices among the 5 for $1 skewers. So good! So addictively salty and spicy, from the double-cooked pork to the fried tofu to even the lovely, tender string beans. And tomorrow morning, I’m headed to Minneapolis for Fourth of July weekend. I’m going to be hanging out with my college girlfriends during our yearly reunion. We’re definitely going to snack on some cheese curds, drink some Leinenkugle’s beer, eat a Jucy Lucy, and try this Mahnomin porridge of wild rice at Hell’s Kitchen. There is nothing that makes me feel so patriotic as knowing that that in this great country of ours, I can stuff myself with spicy beef tendons, heavy on the Sichuan peppercorns, at Metro Cafe in Brooklyn, and then just a few states over, chow down on a hamburger stuffed with pepper jack cheese in Minneapolis. So proud to be an American! That is a direct quote from last night’s Korean Sunday dinner. The best part is that Emily wasn’t too bothered by her discovery. She just reached for the next unknown thing on the table. It is hard to take photos of food on your stove. As I promised on my initial email invite, the Korean food I am cooking each Sunday is not limited to foods that are considered “safe” for non-Koreans. Partly, this is because no cookbook worth its salt restricts itself to food that is “safe” for Americans, but mostly it’s because I love the food I grew up eating and I want to present it honestly, completely, and without apology. I don’t care if my guests don’t find everything appealing as long as they’re willing to sit at a table with the funny food. The friends and their friends who have come to dinner so far, though, have exceeded all my expectations. They not only will sit at a table with something they can’t recognize, they’ll often start eating it before I have a chance to explain what it is. It’s really wonderful to be able to say to a friend, “You can eat that, too,” and have him eat it. So far, the only thing Carl has refused is a kumquat, and eh, it’s not a Korean fruit. And despite my mother’s fears, they’ve honestly and sincerely liked a lot of the “not safe” food I’ve made. Last night’s dinner was a classic blend of food Koreans like to feed foreigners and food Koreans like to feed themselves: 불고기, bulgogi, with lettuce and 쌈장, ssamjang; scallion salad; sautéed oyster mushrooms; cabbage and soybean paste soup; and more banchan, including the aforementioned raw squid which had been preserved in a salty, spicy sauce. Bulgogi is probably the first thing any foreigner is fed when he or she arrives in Korea. (It was voted the favorite Korean food of foreigners!) “Bulgogi” translates literally as “fire meat” since it’s meant to be cooked over a charcoal grill, and a love of grilled meat is probably completely universal. When you add to the meat a marinade of soy sauce, sugar (and/or honey and pear), garlic, green onions, sesame oil and sesame seeds, you end up with something that’s almost boringly likable. At least that’s what I’d always thought until I started doing a little research. As I looked into bulgogi’s history, tried different marinade recipes, and thought about which American cuts of beef would be best for it, I ended up with a lot more respect for the dish. It’s ubiquitous now, but it was a true special-occasion food when meat wasn’t a plentiful commodity. The very thin slices you see these days are a fairly modern invention, and a somewhat brilliant one at that, since it’s a no-fail way to cook meat quickly and keep it tender even when it’s not of the highest-quality. There are regional variations, like the giant hamburger patty bulgogi Diane and I had in Unyang, that demonstrate what a broad meaning “fire meat” still has today. There are a 1001 variations on recipes for bulgogi marinade because it’s ultimately a matter of taste. What is my taste? Less sugar, no fruit tenderizers because I like my meat to retain some chew, plenty of chopped green onions, and lots of sesame seeds. I’m still working on the exact proportions I like best—hopefully, something fantastic will end up in the cookbook. I don’t have as firm an opinion on the cut of meat as I haven’t strayed enough from my mom’s favorites, but sirloin and ribeye are good choices, and I’m curious about what the marinade and the thin slices could do to elevate cheaper cuts of meat. If you don’t have a Korean grocery nearby selling “bulgogi-cut” meat, it’s not hard to cut it yourself. Remember to stick it in the freezer for an hour or two and it’ll still be sliceable but hard enough to cut thinly. The key thing is to cut it against the grain. The sirloin I had sliced by a local butcher was more or less the right thickness, but they didn’t cut it against the grain and the flavor difference between their sirloin and the sirloin I sliced myself was noticeable. Ultimately, though, bulgogi is like bacon—it’s almost never inedible. And that is nothing to sneer at. If bulgogi is “safe,” the ssamjang I served it with definitely wasn’t. I wanted to make one that would be noticeably different from the store-bought kind, and after consultation with my mom and A Korean Mother’s Cooking Notes, I ended up simmering together soybean paste, red pepper paste, ground anchovies, garlic, ground beef, chopped onion, and chopped spicy green peppers. I’m also still working on the exact proportions, so no recipe yet, but the anchovies were a flagrant, unabashed Korean touch. It made me even more gratified that people liked it. It’s such an intense thing to eat straight, which is why it’s meant to be just dabbed onto your beef and wrapped in a crisp piece of lettuce and/or perilla leaf. I think Napa cabbage is beautiful. And the soup that I thought would be most challenging, made primarily of doenjang (soybean paste) and Napa cabbage, was the biggest hit. 배춧국, baechut-guk, or cabbage soup, is my favorite Korean soup, the soup that my mom always has waiting for me when I get home. I was trying some different ways of making Korean beef stock, so this one was simmered only with brisket meat and no bones. But the stock still had surprisingly enough body to hold up the super-strong doenjang my mother had brought from home. It’s so simple but rewarding: beef broth flavored with a couple of spoonfuls of doenjang, more sliced cabbage than you could ever imagine is necessary, and then a last-minute addition of sweet red pepper paste, chopped garlic, and chopped scallions. I can and will give better directions soon, once I’ve worked out a recipe that feeds less than 10, but that’s really it. My friend Carolyn loved it, ate a second bowl of leftovers the next day, and pronounced it the ultimate manifestation of umami flavor. The Korean government is on a kick to promote Korean cuisine as The Next Big Thing. I hope they’re not playing it safe. My friends can’t be the only ones who’ll try anything. The raw squid, though, might take some time. 육개장, yukgaejang (spicy beef soup). My mom, for her part, decided it was completely feasible to teach us five kinds of kimchi in one day—the same day she also taught us 매운탕, maeuntang (spicy fish soup); 된장찌개, doenjang-jjigae (soy bean paste stew); 떡볶이, tteokbokki (sautéed rice cakes); and two kinds of 묵무침, muk-muchim (acorn jelly salad). We didn’t come away with recipes with exact measurements, but we never intended to anyway. We wanted more simply to soak up the almost incidental wisdom the best home cooks always have. Like having my mother tell us that tossing the bellflower roots in its seasoning by hand before sautéing it deepens the flavor, or her great-aunt showing us how to chop pine nuts on a paper towel, which keeps the powdered pine nuts from sitting in their own oil. But with both cooks, we were given tips that we wanted to resist. My mother, in making 깍두기, kkakdugi, the bright-red radish cubes that constitute one of my favorite kinds of kimchi, has started using Splenda instead of sugar. Almost all kimchi needs a bit of sweetness that both rounds out and brings out the tartness and sharpness of the pickled vegetables, but kkakdugi is one of the sweeter ones. She said that she uses Splenda because it doesn’t make the radish cubes sticky, the way sugar does. I nearly threw a fit. I believed my mother, that Splenda could have a completely different effect on the kkakdugi than sugar. But the thought of putting anything that chemical in my kimchi made me feel intensely rebellious and unfilial—no way. I can’t say that my stand is really principled and consistent. I have a general knee-jerk aversion to processed foods (except Cheetos!) that’s probably as much shaped by snobby elitism as by a Luddite wariness of anything grown in a test tube. But I don’t think MSG is the devil incarnate. I won’t include MSG in this cookbook either, because I think it’s too often a short-cut for building flavor the old-fashioned way, but I understand why it’s a standard ingredient for a lot of Asian cooks. It replicates that umami flavor in a way that is near-miraculous. Unless you have a specific allergy to MSG, it’s not any worse for you than salt. I don’t think a restaurant is lazy just because it uses a bit of it here and there any more than I think a restaurant is lazy for cooking with scads of butter. I felt the same feeling of inconsistent rebellion when Diane’s great-aunt also recommended adding a touch of pureed kiwi to the galbi-jjim. There’s nothing unnatural about kiwi. It’s not an indigenous Korean ingredient, but then, neither were chile peppers when they came from the New World via Japan or even Napa cabbage, which came from China and became the most ubiquitous form of kimchi only as late as the 19th century. I’m much warier of a slavish devotion to “authenticity” than I am of MSG, which is why Diane and I want to write recipes that are open to experimentation, especially for people who aren’t able to find certain ingredients. The fact that food is a living, changing, participatory cultural experience is one of the reasons I’m so fascinated by what people eat. So why do I feel so uneasy about Korean recipes that use tropical fruits? We’re still working through an articulate conception of what this cookbook will include and what it won’t, but where would you draw the line? 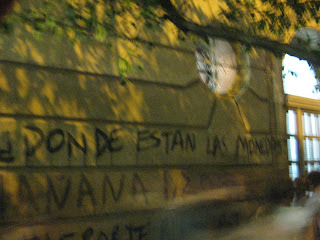 Buenos Aires is a funny city. It has that big-city vibe big-city dwellers always love, but it doesn’t have the mad crush of Mexico City or the ghosts of Paris or the constant hum of New York. It has beautiful old buildings with black filigreed balconies, the kind of balcony you can imagine a Edith Wharton character standing on, and then clunky modern buildings with uglier terraces right next door. Their Jardin Botanico is overrun with abandoned cats, who’ve gone feral by the looks in their eyes, despite the baggies of food and water that are put out for them. And most astonishing to me, their bus system is cheap, fast, and frequent, but it’s impossible to get on a bus because there are not enough coins or monedas to be had anywhere in the city, and they won’t accept bills. People are literally hoarding them. A girl we met last night told us her friends gave her, as a birthday gift, a roll of ten 1 peso coins. The bank restricts its coins, giving only six pesos per person. There are rumors the bus company is selling the coins they collect on the black market, 100 pesos in coins for 105 pesos in bills. 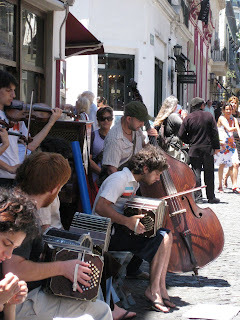 This is Buenos Aires’s way of being a big city. Even though it’s frustrating for porteños, from a tourist’s perspective, the city wears its problems well, with grace, good looks, and lots of very good steak. There has been no surprise there, only in that it has been even better than I expected, and so cheap from a New Yorker’s perspective, we’ve ended up in hysterics with the arrival of each check. We’ve been to two parillas, or grilled meat restaurants, so far with several more on our list. La Dorita was our first happy surprise, a homey, comfortable place with two locations catty-corner from each other in Palermo Hollywood. 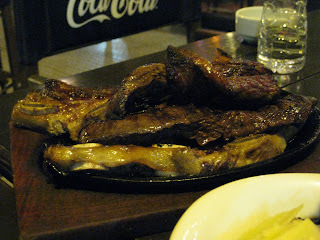 We got a tabla of meat for two, with a choice of three meats—vacio or sirloin, entraña or skirt steak, and asado or short ribs, and then we added half an order of “baby beef,” their funny English translation of “bife de chorizo,” a uniquely Argentine cut of rump and sirloin. I am not a meat connoisseur, able to describe the particular qualities of a supremely good piece of beef, but oh, it was so good! It didn’t matter that they hadn’t actually been cooked “al punto” or medium rare. It reminded me of the chicken in Mexico—only when your meat is crappy do you have to worry about drying it out. Its flavor was there, regardless of whether it was red and raw. 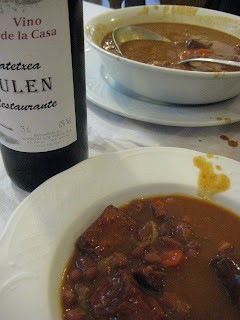 With a good and cheap bottle of Malbec; quite a decent salad with spinach, pumpkin, sun-dried tomatoes, mushrooms and parmesan; and two scoops of ice cream, we ate until we were quite satisfechas for something like $17 per person. I felt almost embarrassed. 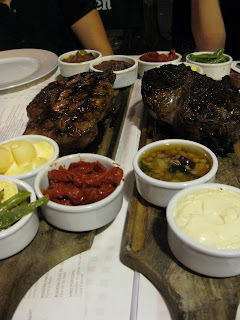 The meat here, of course, was also fantastic, with the ojo de bife or ribeye making their bife de chorizo seem almost tasteless in comparison. Their morcilla, or blood sausage, had a crackling crisp casing, a better snap than any hot dog I’ve ever had, and that smooth taste that’s so familiar to me from soondae, Korean blood sausage. They also have provoleta as an appetizer, a grilled skillet of cheese with herbs that is just a salty luxury. But the appetizers were almost superfluous compared to the dozen or more little ramekins they gave us filled with things like tapenade, apple sauce, roasted garlic, green beans, potatoes in aioli. There’s just something so happy-making about a whole array of side-dishes. 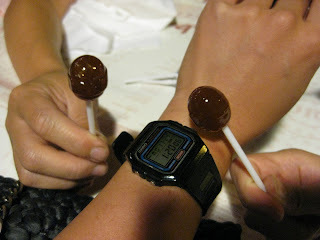 We topped off the night with glasses of champagne and lollipops from their lollipop tree. There’s so much about this city I still don’t understand, but champagne and lollipops, that was easy. I’m home. I’m lucky I have two places to call home: Brooklyn, New York, U.S.A., and Seoul, Korea. Brooklyn has its obvious charms, particularly the absolute joy of living alone without one’s parents, but as I get older, being at home with my parents in Seoul has its own incomparable sense of comfort and ease. There’s the twin bed I slept in from the age of 9 through high school graduation, the little yard I used to run around with our dog, and most of all, the ugly, ornate, wood table on which I ate so many of my meals growing up. Before I left New York, my mom called to see what I wanted to eat for my first meal when I arrived home. I knew if I gave her even the slightest encouragement, there would be an almost-obscene amount of food waiting for me. So I said to her over and over, I really can’t eat that much just getting off the plane, just a bowl of my favorite Korean soup will do. It’s hard for me to describe what 배춧국, or baechutguk, tastes like. How would your average American describe the taste of mac and cheese, of meatloaf? (Meatloaf, incidentally, remains one of the most bewildering food items to me.) It’s a fermented soybean soup, made from doenjang, which is a more aggressive, Korean version of the Japanese miso, with a beef broth-base, in which sliced Napa cabbage is simmered until it’s tender and delicious. That’s really it. You can throw in some minced garlic and green onions to add a bit more bite, but you don’t need much else. With a bowl of rice and a few small plates of banchan, maybe some spicy, chewy anchovies or black beans cooked in soy sauce and sugar, it is the perfect meal for someone who has been traveling for almost 24 hours. I didn’t take a picture because I was too busy basking in the warmth of my mother’s love. But here are some pictures of a spicy 나물, namul, of greens dressed with garlic and sesame seeds, with fresh homemade 김치, kimchi, in the background. And then there is my sister’s favorite food of all time, Korean braised short ribs with chestnuts, or 갈비찜. I ate all this for lunch the next day. I am lucky that my mother is who she is, and that I am her daughter.